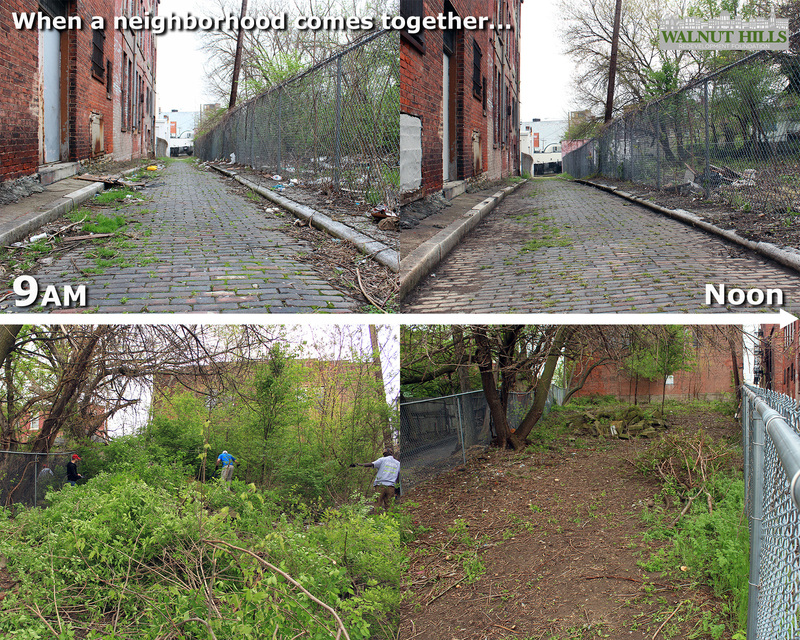 On Saturday, April 27th, Spring in Our Steps had the pleasure of partnering with the Walnut Hills Redevelopment Foundation to clean-up the Five Points Alley intersection located between E McMillan, Gilbert and Copelen Streets. The main focus of the clean-up was the lengths and convergence of Finch, Sedalia, Pana, and London Alleys, which make up the unofficial Five Points designation. Around 20 to 30 community members worked together to clear overgrowth, trash, and a rusted out fence, filling two SuperCans from Keep Cincinnati Beautiful. Along with clearing a dumpsite and painting over graffiti. After three hours of hard work, beautiful brick was exposed, views through the neighborhood were opened up, and new friendships were made. As organizers of similar events, we at Spring in Our Steps were not only delighted to be able to show up with nothing but a smile and enthusiasm. But it was inspiring for us to witness so many members of a community come together for a common goal. Walnut Hills Redevelopment Foundation’s ultimate goal is to make this a safe and clean thoroughfare for community events. They have so many great visions for the space, including subsequent outings to the alleys to maintain them for continued use. This is something that we feel is key to revitalizing such unique spaces. This coming weekend, we will be heading to Five Points again to finish what we started. We would love for you to join us! For more info and to RSVP, please visit the event page. Spring in Our Steps volunteers will receive one of our limited edition t-shirts from our partnership with the Flying Pig Marathon. The first of many summer events at Five Points starts this Sunday, May 19th, with food vendors and a pop-up biergarten! Come celebrate with an array of Cincinnati residents, Walnut Hills Redevelopment Foundation and Spring in Our Steps in a uniquely historic location. Have a beer and make some new friends of your own! Just wanted to let you know about the alley connecting Loth and Mulberry. The metal and the tires were recycled. The City took the tires. Scrappers took the metal shelving and fencing. Thank you for making my neighborhood look better. You can reach me at 513-241-3252. On the second of July, some vandal cut down a shingle oak tree on Loth behind the school. It was 20 feet high and 6 inches in diameter. I was very upset as I had planted it 10 years ago and it was in great form and health. I will talk with urban forestry and the police on the 8th. This entry was posted on May 16, 2013 by Pam Sattler in Alleys and tagged Biergarten, Finch Alley, Five Points, London Alley, Pana Alley, Sedalia Alley, Walnut Hills, Walnut Hills Redevelopment Foundation.